Dr. Mercola has been the most valuable source that helped me discover a far healthier regimen than the government recommendations, and his work even helped me to ﻿break my dependency on the American medical cartel﻿. However, he has published ﻿﻿﻿﻿﻿an article that is pure propaganda﻿ in which he promotes Anthropogenic Global Warming alarmism. Even worse, his trusted site moderator (or Mercola himself?) began fudging the likes and dislikes for the comments for this article. Mercola began this article by asking the reader to put aside any notions about AGW because the real issue is toxicity and pollution, and then he immediately violated his own advice and started pushing AGW hard. His article's main point is a video in which Leonardo DiCaprio (yes! the actor!) investigates AGW, and Leonardo relies on the expertise of the UN and National Geographic. Now anyone who is paying attention should have long since learned that anything coming out of mainstream Hollywood or the UN is propaganda, and National Geographic has been increasingly riddled with propaganda itself, and now, NatGeo has also gone full propaganda — like Hollywood and the UN. At first, I found it very encouraging that in the comments, a large majority of Mercola's readers disagreed with him, which is unprecedented. Disagreeing with Mercola will ordinarily get the comment shunned just as fast and as severely as on any other guru's site; however, in this case, the top comments had dozens of likes and were all ant-AGW in opposition to Mercola. These anti-AGW comments were steadily climbing in likes, but then I noticed that my new anti-AGW comment, and several others, started off by instantly receiving 5 dislikes. Then I noticed that the pro-AGW response to my comment got one dislike, then a second dislike, and then instantly got 20 likes. Clearly some moderator (Mercola?) had put his thumb on the scales. Such fudging of the numbers reminds me of how Michael Mann fudged the data to produce that propaganda known as the hockey stick chart. Over the next couple of hours I observed the same pattern. Anti-AGW comments steadily increased in likes, and occasionally decreased in likes in large instant drops. Whereas, pro-AGW comments steadily increased in dislikes, and only increased in likes in large instant gains. 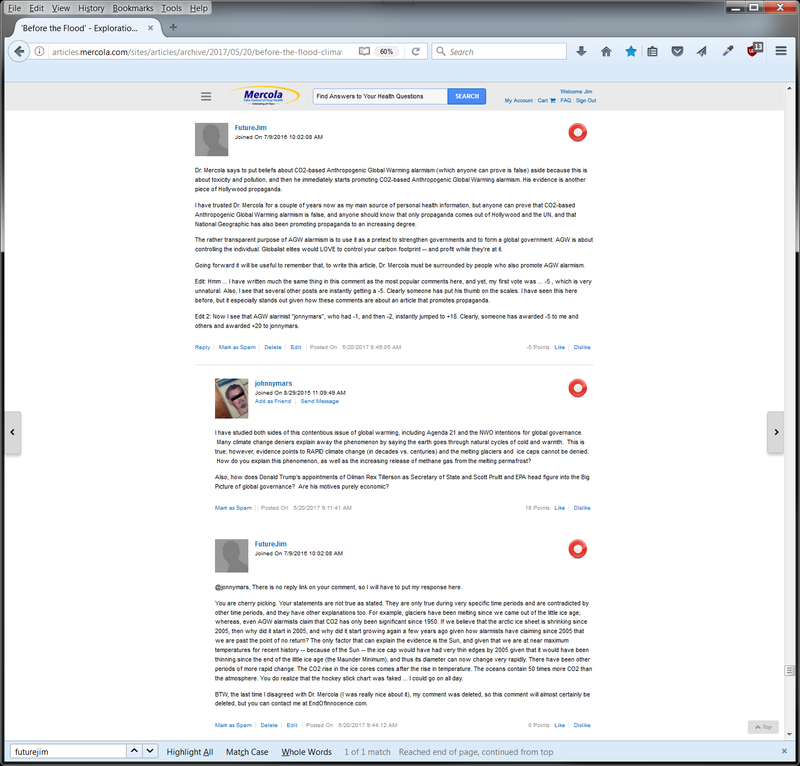 I then went back to see if anything had happened to the top comments (all anti-AGW), and they were gone! The top comment had steadily climbed to over 60 likes before, and now there were twice as many comments, so it would have easily had over 100 likes, but it was gone, and the top comment only had 45 likes, and all of the top comments were now pro-AGW! Such cheating! 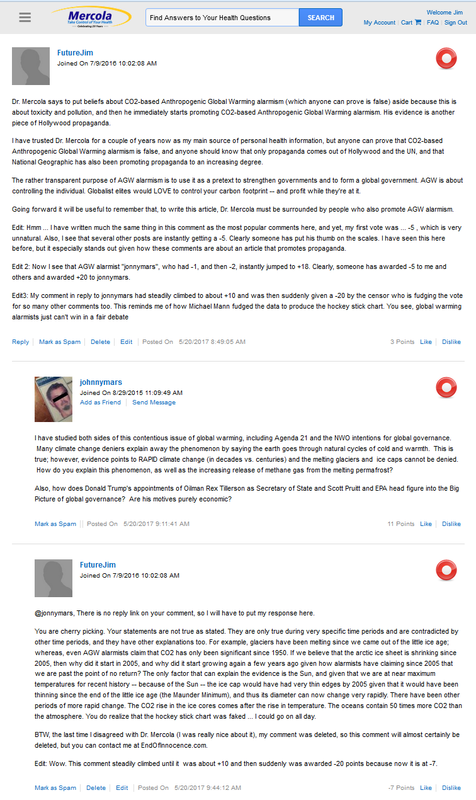 Of course, AGW alarmists can't win a fair debate, so they must cheat.